Despite dropping a whopping 64.2% at the box office this weekend, The Hunger Games: Mockingjay Part 2 still managed to hold on to the top spot for the third week in a row with $18.6 million. The franchise finale opened in the top spot with $101 million, although that tally was the lowest debut of all four movies in the blockbuster franchise, and it took in $51.6 million over the Thanksgiving holiday weekend, beating out Pixar's The Good Dinosaur, Warner Bros.' Creed and 20th Century Fox's Victor Frankenstein. The Hunger Games: Mockingjay Part 2 bested this weekend's only new release, the holiday horror-thriller Krampus, according to http://www.boxofficemojo.com/weekend/chart/|Box Office Mojo}. 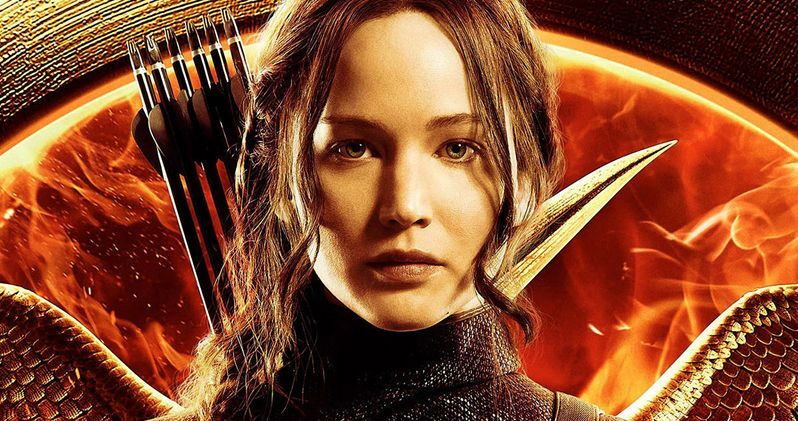 The Hunger Games: Mockingjay Part 2 has now earned $227.1 million after opening on November 20. Krampus debuted in second place this weekend with $14.5 million, earning a $5,520 per-screen average from 2,902 theaters. Warner Bros.' Creed stayed put in third place this weekend with $15.54 million, while Pixar's The Good Dinosaur dropped to fourth place with $15.51 million. Krampus earned a solid 64% "Fresh" rating on Rotten Tomatoes. Pixar's The Good Dinosaur, which opened in 3,749 theaters last weekend, is already a hit with the nation's critics, earning an impressive 86% Fresh rating on Rotten Tomatoes. The Hunger Games: Mockingjay Part 2 is still faring well with critics, with a 71% Fresh rating, but its predecessors have all dropped more than 50% on their opening weekend, which isn't a surprise since blockbusters like this are normally front-loaded. While The Hunger Games: Mockingjay Part 2 did have the lowest opening weekend in franchise history, its second weekend drop of 49.7% was also the smallest decrease of the four films, which could mean it will have more staying power than its predecessors, and it could earn even more in its third weekend, but we'll have to wait and see. Creed, a spinoff of the Rocky franchise, is also a hit with critics, taking in an astounding 93% "Fresh" rating on Rotten Tomatoes, with Sylvester Stallone and Michael B. Jordan's performances already being hailed as Oscar-worthy by some critics. Adonis Johnson (Michael B. Jordan), whose father Apollo Creed died before he was born, heads to Philadelphia, the site of Apollo Creed's legendary match with a tough upstart named Rocky Balboa. Once in the City of Brotherly Love, Adonis tracks Rocky (Sylvester Stallone) down and asks him to be his trainer. Despite his insistence that he is out of the fight game for good, Rocky sees in Adonis the strength and determination he had known in Apollo-the fierce rival who became his closest friend. Agreeing to take him on, Rocky trains the young fighter, even as the former champ is battling an opponent more deadly than any he faced in the ring. While the holiday season represents the most magical time of year, ancient European folklore warns of Krampus, a horned beast who punishes naughty children at Christmastime. When dysfunctional family squabbling causes young Max (Emjay Anthony) to lose his festive spirit, it unleashes the wrath of the fearsome demon. As Krampus lays siege to the Engel home, mom (Toni Collette), pop (Adam Scott), sister (Stefania Owen) and brother must band together to save one another from a monstrous fate. The supporting cast includes Allison Tolman and David Koechner, with Michael Dougherty (Trick 'r Treat) directing. Spectre rounded out the top 5 this weekend with $5.4 million. Rounding out the top 10 is The Night Before ($4.9 million), The Peanuts Movie ($3.5 million), Spotlight ($2.9 million), Brooklyn ($2.5 million) and Secret in Their Eyes ($1.9 million). After a stellar opening in limited release, The Weinstein Company didn't expand The Danish Girl, another awards season contender starring Eddie Redmayne, Alicia Vikander and Amber Heard. The drama, based on an incredible true story, took in $185,000 from four theaters, for an impressive $46,250 per-screen average. It remained in four theaters again this weekend, earning $106,000 for a $26,500 per-screen average. Opening in limited release are Spike Lee's Chi-Raq, which earned $1.2 million from 305 theaters for a $4,099 per-screen average. Freestyle Releasing's The Letters took in a paltry $802,000 from 886, earning a horrid $905 per-screen average. The Weinstein Company's Macbeth earned $67,868 from five theaters for a $13,574 per-screen average, with Fox Searchlight's Youth earning $80,000 from four theaters for a $20,000 per-screen average. No box office data was released for Amplify's Christmas Eve, Cohen Media Group's Hitchcock/Truffaut, Sony Pictures Classics' The Lady in the Van, Cinedigm's Life, Saban Films' Mi-5, Atlas Distribution's A Royal Night Out, Drafthouse Films' The World of Kanako. Looking forward to next weekend, Warner Bros.' In the Heart of the Sea is the only movie opening in wide release, but there are also another slate of potential awards season candidates arriving in limited release. Paramount will release The Big Short, starring Brad Pitt, Christian Bale, Ryan Gosling and Steve Carell on December 11, with a nationwide expansion planned for December 23. Lionsgate will also roll out Don Verdean, starring Sam Rockwell and Amy Ryan, along with Gravitas Ventures' Bleeding Heart, GKIDS' The Boy and the World, Broad Green Pictures' The Dark Horse and Broad Green Pictures' The Girl in the Book. Universal will also expand Legend, starring Tom Hardy, nationwide on December 11. Check back on Sunday for the box office estimates, but until then, take a look at our predictions for the weekend of December 4.